Autograph Letter Signed to unknown addressee. Boston, 11 September 1785. 12mo (18.5 cm, 7.25"). pp..
Otis was a Boston merchant, the brother of revolutionary James Otis, Jr., and of America's first female playwright, Mercy Otis Warren. In 1789 he was elected Secretary of the United States Senate. Here he writes, "my creditors have indeed fallen upon me without mercy." 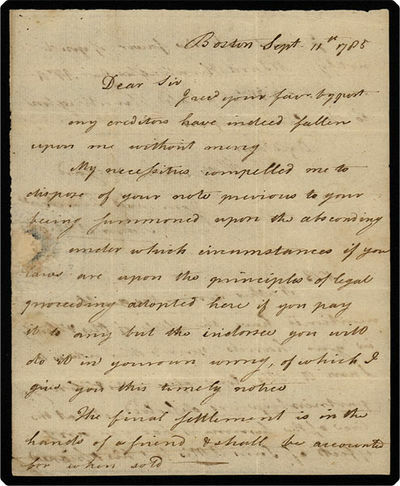 He assures his correspondent that the note that he owes him is a personal one and not drawn on Otis's company; so, he advises the correspondent not to accede to any demands of Otis's business creditors regarding that note.